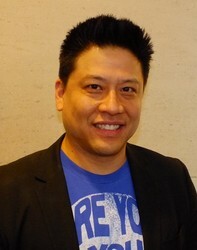 Born in Riverside, California to Chinese immigrant parents, Garrett Wang (pronounced Wong) spent his formative years on the move, living in Indiana, Bermuda and Tennessee. He moved to Los Angeles to attend UCLA where he majored in East Asian Studies and minored in theater. He was especially proud of his portrayal of Michio Tanaka in Wakako Yamauchi's play 12-1-A, which commemorated the 50th anniversary of the wrongful internment of Japanese American civilians during World War II. In his first stage performance outside of UCLA, Garrett garnered critical acclaim as the lead in Chay Yew's controversial play, Porcelain. For five years, Garrett focused on theater and attempted to convince his Asian parents and relatives that acting was a viable profession, as opposed to becoming a doctor as he had originally planned since eighth grade. With his parents finally on his side, he signed with his first talent agent in 1993. Within a year he landed his first speaking role, guest starring on the first episode of the ABC sitcom All American Girl starring comedienne Margaret Cho. Three months later, Wang was cast in the role of Harry Kim on Star Trek Voyager. In addition to being a series regular on Voyager, Garrett was named as one of People Magazine's 50 Most Beautiful People as well as one of E! Channel's "20 Coolest Bachelors." Since 2005, Garrett has taken an extended break from Hollywood. With the exception of the occasional cameo appearance in random indie projects such as the comedy Unbelievable, Garrett has been focused on traveling the world, working behind the scenes at Dragon Con, designing scifi/fantasy inspired tee-shirts and relishing the role of an avid NFL Football fan.